In 2018 the Festival of Goodwill at the full moon during Gemini occurs on Tuesday, May 29 at 7:19 am PDT / 14:19 UT. Note: These audio clips are in MP3 format. If you are unable to hear them when you click the title below, you probably need to set your preferred application within your browser. And, if your browser creates an interfering window when you click to listen, you should be able to bring this text window forward to follow the words, while the clips play. There are three major festivals on this planet, which form the spiritual high point of the year. These occur in the Spring. The first is the Festival of the Risen Son (Sun) or Easter, which is celebrated in the western hemisphere at the Aries full moon. The second is the Festival of the Wesak, or of the Buddha, and is celebrated in the eastern hemisphere at the Taurus full moon. The third is the Festival of Goodwill, which occurs at the Gemini full moon and celebrates the spirit of humanity, which is dedicated to right human relations and aligns itself with the will of God. These three festivals can be a means of achieving a great spiritual unity, throughout the planet. The three planetary festivals crescendo in revelation, producing seven great results. The first result: Power will be given to the disciples of the world and the initiates among humanity, so that they can direct efficiently and wisely the process of rebuilding. The second result: The will-to-love will stimulate people of goodwill everywhere, gradually overcoming hatred. The inner urge in humanity to live together cooperatively already exists, and is subject to stimulation. The third result: The will-to-action will lead intelligent people throughout the world to begin those activities which will lay the foundation for a new, better and happier world. Result number four: The will-to-cooperate will steadily increase. People will desire and demand right human relationships as a natural way of life. The fifth result: The will-to-know and to think correctly and creatively will become an outstanding characteristic of all humanity. Knowledge is the first step towards wisdom. The sixth result: The will-to-persist will become a human characteristic ~ a sublimation of the basic instinct of self-preservation. This will lead to a persistent belief in the ideals presented by the world workers, and a true demonstration of immortality. The seventh result: The will-to-organize will further a building process which will be carried forward under the inspiration of the world workers. The medium will be the potency of the will-to-good of this New Group of World Servers and the responsive goodwill of all people. Those participating in these three festivals report a building of energy. The energies of power, love and wisdom accumulated at the first two celebrations are focused and utilized for expression at the third festival. This is the festival of the spirit of humanity aspiring towards God, seeking conformity with the will of God, and dedicated to the expression of right human relations. The forces of reconstruction are active now, and greatly affect the nations of the world. These energies can increase the aspect of national life or they can increase the potency of world unity, peace and progress. This is a festival of deep invocation, and an appeal for a basic aspiration toward kinship. It is a time of human and spiritual unity. The Will-to-Synthesize is present now. All who seek right human relations, seeing no true or basic difference between religions and nations, comprise the New Group of World Servers. They may be aligned with any of the great world religions, yet in no way interfere with the allegiances or beliefs of others. Knowledge ... is the hallmark of our civilization. Often this knowledge has been misapplied and dedicated to the selfishness of individuals. But things are changing! Now another phase of enlightenment has begun to appear as a result of the past ... and that is wisdom. Wisdom is the enlightened application of knowledge, through love, to the affairs of humanity. It is understanding, pouring out everywhere, as the result of experience. Forgiveness is one of the greatest gifts of spiritual life. It enables us to be released from the sorrows of the past. Forgiveness is simply an act of the heart, a movement to let go of the pain, the resentment, and the outrage we have carried as a burden for so long. It is an easing of our own heart, and an acknowledgment that, no matter how strongly we have suffered from the evil deeds of others, we will not put another human being out of our heart. We have all been harmed, just as we have harmed ourselves and others. Remember ... forgiveness is to forget ... to forget is never to bring back to remembrance again. Abandon your dreams of vague beauty, impossible Utopias, and wishful thinking, to face life as it is today. Begin, right where you are, to make it better. Experiment with Right Human Relations. Begin educating all you contact so they respond to the vision, attaining right individual, group, national and international relations. Realize that no one is futile or useless; everyone is valuable. Goodwill is a dynamic energy and will bring about fundamental world changes. Desiring the greatest good for all, the combined power of goodwill, forgiveness, love, sharing and wise understanding, is beyond belief. This power has never been fully employed. So begin now, right were you are. You can today, save the world! At this full moon, there is a festival in the heavens. This occurs as the Gemini full moon enters the white ether of the Milky Way. This is the place of reunion, of true kinship, the place of cosmic consciousness. It is a place within the galactic magnetic field. It is from here that we receive an exceptional spiritual outpouring into our hearts from the spiritual Sun, Sirius. This galactic magnetic field carries this blessing to ALL on Earth during this time. Its highest effect is world unity. We call you, everyone, to a great service ... of demand and of invocation on behalf of humanity ~ a demand for the inflow of light upon the decisions of humanity. We ask you to request and expect the needed enlightenment for those who have to make decisions on behalf of humanity everywhere. Our individual enlightenment has nothing to do with this demand. It is a selfless motive which is required and which must lie behind our individual and group demand. We are demanding enlightenment and illumined perception for those who have to guide the destiny of races, nations, and world groups. On their shoulders lies the responsibility to take wise action, based on world understanding and in the interests of international cooperation and in the establishment of right human relations. The rose is a symbol of the love which is available now. Contemplate its fragrance and the beauty of its form, and imagine that your heart is a rose and that its fragrance permeates your entire being. As your love widens, it rises into the plane of spirit and becomes universal. The more you can give forth love into the world, the more you are raising the whole vibration of the Earth. May love bloom forth like the rose in the garden of the temple of your heart. May the power of the one life pour through to group of all true servers. May the love of the one soul characterize the lives of all who see to aid the great ones. May I fulfill my part in the one work ... through self forgetfulness, harmlessness, and right speech. 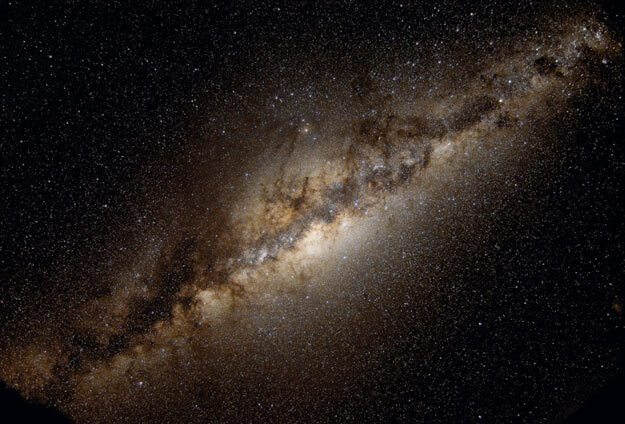 Top photo: " The Milky Way in Stars and Dust"